The present application is a continuation of U.S. application Ser. No. 12/134,547, filed on Jun. 6, 2008, which is a continuation of U.S. application Ser. No. 10/687,270, filed on Oct. 16, 2003, which are incorporated herein in their its entirety by reference thereto. Some bad breath seems to be associated with actual periodontal disease and is therefore a useful clue to physicians and dentists. The presence of several key bacteria such as Treponema Denticola, Porphyromonas Gingivalis and Bactericides Forsythesis can be founding plaque or the tongue. 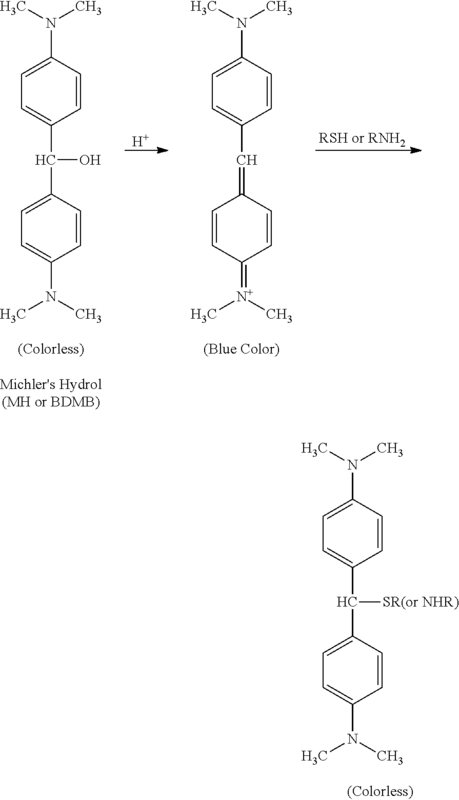 Suitable visual indicating agents are 4,4′-bis(dimethylamino)-benzhydrol (BDMD or Michler's hydrol (MH)) and related dyes having the general formula (I) or (II). The device includes a simple carrier portion defining a passage, such as a substantially transparent tube or straw, containing the visual indicating agent and which is open on at feast one end. While the invention will be described hereinafter with particular reference to straws and tubes, it will be understood that the invention is useful with various other shapes as well. For example, the shape of the passageway may be cylindrical, triangular, square, almond-shaped and so forth. Unless otherwise specified, chemicals and biochemicals were obtained from Sigma-Aldrich of Milwaukee, Wis. Absorbance readings were measured using a microplate reader from Dynex Technologies of Chantilly, Va. (Model 4 MRX). Color intensities (L*a*b* values) herein were measured using a handheld spectrophotometer from Minolta Co. Ltd. of Osaka, Japan (Model #CM2600d). This instrument utilizes the D/8 geometry conforming to CIE No. 15, ISO 772411, ASTM E1164 and JIS Z8722-1982 (diffused illumination) 8 degree viewing system, The D65 light reflected by the specimen surface at an angle of 8 degrees to the normal of the surface is received by the specimen-measuring optical system. Paper towels or KIMWIPES® tissues from Kimberly-Clark Corporation of Dallas, Tex., USA were coated with Snowtex-O® nanoparticles (pH 4.1), available from Nissan Chemical, and were used in the examples described herein with Milchler's hydrol dye (MH or BDMB) where dye was added without acetate buffer, unless otherwise indicated. Several volunteers were also given a number of these straws and were asked to blow into them with one lung-full of breath. The tubes demonstrated bad breath sensitivity, typically with morning breath or after a spicy meal. Color change of the indicator articles was easily observable with an unaided eye, and the color intensities (La*b*) were measured using a handheld Minolta spectrophotometer from Minolta Co. Ltd, Osaka, Japan, Model #CM-2600d. An example of the data obtained from one sample is shown in Table 3 below. The above color change readings, expressed as ΔE, show the sensitivity of the dye to the bad breath odor. The readings were calculated by comparing the sample to the white standard. Thus the larger the ΔE value, the more colored the sample. As the sample decolorizes on exposure to bad breath, the blue becomes paler in color and this is reflected in the smaller ΔE value, i.e. the color is moving closer to white. The human eye can distinguish between samples having differences in ΔE of 3 or greater. Thus, the eye can easily tell the difference between samples which had bad breath levels of 2 and 3 (as measured using the BreathAlert™ device), as well as the difference between the control and a sample having a bad breath of level 2. As illustrated in FIG. 5, a drinking straw 20 from Glad Products Company of Oakland, Calif., was placed on a cardboard strip 22, and a piece of the dye-nanoparticle coated tissue 24 was placed over a first end 25 of the straw 20. Thus, when a person breathes into the second end 28 of the straw, their breath would pass through the tissue 24 at the first end of the straw. The straw was placed between two sheets of polyethylene 28 which were then heat-sealed so that only the second end 26 of the straw was exposed. A reference (or control) color strip 30 was also placed between the polyethylene sheets near, but separate from, the first end 24 of the straw and sealed when the polyethylene sheets were heat sealed. This reference strip was a piece of the dye-coated tissue and allows the user to compare the color of the strip over the first end of the straw with the reference strip to see if there has been a color change, and hence to determine whether he or she has bad breath (right). The reference strip could also include a scale of two or more shades of blue so that the user could compare the change of color of the tissue over the straw with the scale, and so determine the degree of his or her bad breath. For example, a slight change in the color could represent mild bad breath, a more pronounced fade to a lighter blue could represent medium bad breath, and a complete change from blue to colorless could represent very bad breath. 1. 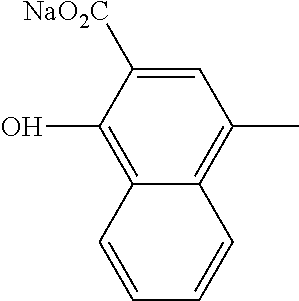 A breath testing device comprising a substrate and a visual indicating agent contained on the substrate, wherein the visual indicating agent is color sensitive to at least one odorous compound present in the breath of a user, wherein the visual indicating agent contains 4,4′-bis(dimethylamino)-benzhydrol, further wherein the substrate is configured to detect the odorous compound in a breath sample. 2. The breath testing device of claim 1, wherein the odorous compound contains sulfur. 3. The breath testing device of claim 1, wherein the odorous compound contains an amine. 4. The breath testing device of claim 1, wherein the substrate contains nanoparticles. 5. The breath testing device of claim 4, wherein the nanoparticles have an average length, width, height, and/or diameter of less than about 100 nanometers. 6. The breath testing device of claim 4, wherein the nanoparticles have a surface area of from about 50 to about 1000 square meters per gram. 7. The breath testing device of claim 4, wherein the nanoparticles include silica, alumina, or combinations thereof. 8. The breath testing device of claim 1, wherein the substrate contains a fibrous material. 9. The breath testing device of claim 8, wherein the fibrous material contains cellulosic fibers. 10. The breath testing device of claim 1, wherein the substrate is planar. 11. The breath testing device of claim 1, wherein the substrate is located within a passage of a carrier portion. 12. The breath testing device of claim 11, wherein the carrier portion is a cylindrical structure. 13. The breath testing device of claim 1, wherein the substrate covers an end of a carrier portion. 14. The breath testing device of claim 1, wherein the visual indicating agent is applied to the substrate as a solution. 15. The breath testing device of claim 14, wherein the concentration of the visual indicating agent is from about 0.001 to about 15% wt/wt. 16. The breath testing device of claim 1, further comprising a zone having a reference color, the reference color being the color to which the indicating agent will change upon exposure to the odorous compound. 17. A dispenser containing the breath testing device of claim 1. 18. The dispenser of claim 17, further comprising at least one breath freshener, wherein the breath testing device and breath freshener are contained in different compartments of the dispenser. 19. 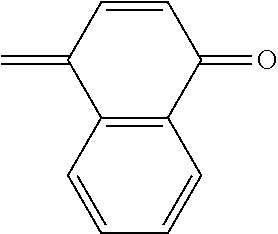 A breath testing device comprising a carrier portion defining a passage that is open at least one end, wherein the device contains visual indicating agent that is color sensitive to at least one odorous compound present in the breath of a user, wherein the visual indicating agent contains 4,4′-bis(dimethylamino)-benzhydrol. 20. The breath testing device of claim 19, wherein the substrate is located within a passage of a carrier portion. 21. The breath testing device of claim 20, wherein the carrier portion is a cylindrical structure. Abstract of Article-Non-hydrothermal synthesis of copper-, zinc- and copper-zinc hydrosilicates, T. M. Yurieva et al., Materials Research Innovations, vol. 5, No. 1, Jun. 2001, pp. 3-11. Abstract of Article—Non-hydrothermal synthesis of copper-, zinc- and copper-zinc hydrosilicates, T. M. Yurieva et al., Materials Research Innovations, vol. 5, No. 1, Jun. 2001, pp. 3-11. Abstract of Japanese Patent No. JP04255767 Sep. 10, 1992. Abstract of Japanese Patent No. JP05098185 Apr. 20, 1993. Abstract of Japanese Patent No. JP1262868 Oct. 19, 1989. Abstract of Japanese Patent No. JP198610366 Jan. 11, 1986. Abstract of Japanese Patent No. JP2001208753 Mar. 8, 2001. Abstract of Japanese Patent No. JP2157039 Jun. 15, 1990. Abstract of Japanese Patent No. JP3195562 Aug. 27, 1991. Abstract of Japanese Patent No. JP4335141 Nov. 24, 1992. Abstract of Japanese Patent No. JP5106199 Apr. 27, 1993. Abstract of Japanese Patent No. JP5261246 Oct. 12, 1993. Abstract of Japanese Patent No. JP57135360 Aug. 20, 1982. Abstract of Japanese Patent No. JP6285140 Oct. 11, 1994. Abstract of Japanese Patent No. JP7256025 Oct. 9, 1995. Abstract of Japanese Patent No. JP8152409 Jun. 11, 1996. Abstract of Japanese Patent No. JP9143872 Jun. 3, 1997. Abstract of Japanese Patent No. JP92067913 Oct. 29, 1992. Abstract of SU834073 May 30, 1981. Article-A new method for predicting and confirming ovulation, Albrecht, B.H. et al., (1985), Fertility and Sterility, 44(2), 200-5. Article—A new method for predicting and confirming ovulation, Albrecht, B.H. et al., (1985), Fertility and Sterility, 44(2), 200-5. Article-A Relationship Between Human Oral Bacteria and the Menstrual Cycle, Prout, R.E., et al, (1970), The Journal of Periodontology, pp. 30-33. Article—A Relationship Between Human Oral Bacteria and the Menstrual Cycle, Prout, R.E., et al, (1970), The Journal of Periodontology, pp. 30-33. Article-A sorbent tube for oral malodour monitoring, Julia Rodríguez-Fernández et al., Talanta, vol. 62, 2004, pp. 421-426. Article—A sorbent tube for oral malodour monitoring, Julia Rodríguez-Fernández et al., Talanta, vol. 62, 2004, pp. 421-426. Article-Adsorption of Dyes on Nanosize Modified Silica Particles, Guangwei Wu et al., Journal of Colloid and Interface Sciences, vol. 195, 1997, pp. 222-228. Article—Adsorption of Dyes on Nanosize Modified Silica Particles, Guangwei Wu et al., Journal of Colloid and Interface Sciences, vol. 195, 1997, pp. 222-228. Article-Adsorption of Gases in Multimolecular Layers, Stephen Brunauer et al., The Journal of the American Chemical Society, vol. 60, Feb. 1938, pp. 309-319. Article—Adsorption of Gases in Multimolecular Layers, Stephen Brunauer et al., The Journal of the American Chemical Society, vol. 60, Feb. 1938, pp. 309-319. Article-Adsorption of Proteins and Antibiotics on Porous Alumina Membranes, Yi Hua Ma et al., Fundamentals of Adsorption, vol. 80, 1992, pp. 389-396. Article—Adsorption of Proteins and Antibiotics on Porous Alumina Membranes, Yi Hua Ma et al., Fundamentals of Adsorption, vol. 80, 1992, pp. 389-396. Article-Ammonia vapour in the mouth as a diagnostic marker for Helicobacter pylori infection: preliminary "proof of principle" pharmacological investigations, C. D. R. Dunn et al., British Journal of Biomedical Science, vol. 58, 2001, pp. 66-76. Article—Ammonia vapour in the mouth as a diagnostic marker for Helicobacter pylori infection: preliminary "proof of principle" pharmacological investigations, C. D. R. Dunn et al., British Journal of Biomedical Science, vol. 58, 2001, pp. 66-76. Article-Applicability of a SPME method for the Rapid Determination of VOCs, Bénéet al., Chimia, vol. 56, No. 6, 2002, pp. 289-291. Article—Applicability of a SPME method for the Rapid Determination of VOCs, Bénéet al., Chimia, vol. 56, No. 6, 2002, pp. 289-291. Article-Breath biomarkers for detection of human liver diseases, preliminary study, Sehnert, S.S. et al., (2002), Biomarkers, 7, 174-187. Article—Breath biomarkers for detection of human liver diseases, preliminary study, Sehnert, S.S. et al., (2002), Biomarkers, 7, 174-187. Article-Breath pentane analysis as an index of lipid peroxidation, a functional test of vitamin E status, Lemoyne, M. et al., (1987), American Journal of Clinical Nutrition, 46, 267-272. Article—Breath pentane analysis as an index of lipid peroxidation, a functional test of vitamin E status, Lemoyne, M. et al., (1987), American Journal of Clinical Nutrition, 46, 267-272. Article-Changes in Concentration of Volatile Sulfur Compounds of Mouth Air during the Menstrual Cycle, Tonzetich, J. et al., (1978A), Journal of International Medical Research, 6, 245-254. Article—Changes in Concentration of Volatile Sulfur Compounds of Mouth Air during the Menstrual Cycle, Tonzetich, J. et al., (1978A), Journal of International Medical Research, 6, 245-254. Article-Characterisation of novel modified active carbons and marine algal biomass for the selective adsorption of lead, Malik et al., Water Research, vol. 36, 2002, pp. 1527-1538. Article—Characterisation of novel modified active carbons and marine algal biomass for the selective adsorption of lead, Malik et al., Water Research, vol. 36, 2002, pp. 1527-1538. Article-Comparison of non-invasive tests to detect helicobacter pylori infection in children and adolescents, results of a multicenter European study, Megraud, F. et al., (2005), Journal of Pediatrics, 146, 198-203. Article—Comparison of non-invasive tests to detect helicobacter pylori infection in children and adolescents, results of a multicenter European study, Megraud, F. et al., (2005), Journal of Pediatrics, 146, 198-203. Article-Development of novel dye-doped silica nanoparticles for biomarker application, Swadeshmukul Santra et al., Journal of Biomedical Optics, vol. 6, No. 2, Apr. 2001, pp. 160-166. Article—Development of novel dye-doped silica nanoparticles for biomarker application, Swadeshmukul Santra et al., Journal of Biomedical Optics, vol. 6, No. 2, Apr. 2001, pp. 160-166. Article-E-nose technologies promise new diagnostic instruments, Skelley, D.S., (2000), IVD Technology, Jan.-Feb. issue. Article—E-nose technologies promise new diagnostic instruments, Skelley, D.S., (2000), IVD Technology, Jan.-Feb. issue. Article-Exhaled nitric oxide, the missing link between asthma and obesity, de Winder-de Groot et al., (2005), Journal of Allergy and Clinical Immunology, 115, 419-420. Article—Exhaled nitric oxide, the missing link between asthma and obesity, de Winder-de Groot et al., (2005), Journal of Allergy and Clinical Immunology, 115, 419-420. 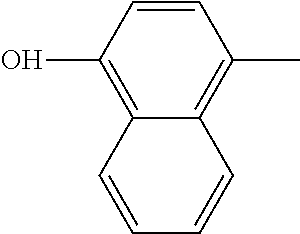 Article-Fe-MCM-41 for Selective Epoxidation of Styrene with Hydrogen Peroxide, Qinghong Zhang et al., The Chemical Society of Japan, Chemistry Letters 2001, pp. 946-947. Article—Fe-MCM-41 for Selective Epoxidation of Styrene with Hydrogen Peroxide, Qinghong Zhang et al., The Chemical Society of Japan, Chemistry Letters 2001, pp. 946-947. Article-From Cyclodextrin Assemblies to Porous Materials by Silica Templating, Sebastian Polarz et al., Angew. Chem. Int., vol. 40, No. 23, 2001, pp. 4417-4421. Article—From Cyclodextrin Assemblies to Porous Materials by Silica Templating, Sebastian Polarz et al., Angew. Chem. Int., vol. 40, No. 23, 2001, pp. 4417-4421. Article-Grafting of Poly (ethylenimine) onto Mesylated Cellulose Acetate, Poly (methyl methacrylate) and Poly(vinyl chloride), Christopher J. Biermann et al., Carbohydrate Polymers, vol. 12, 1990, pp. 323-327. Article—Grafting of Poly (ethylenimine) onto Mesylated Cellulose Acetate, Poly (methyl methacrylate) and Poly(vinyl chloride), Christopher J. Biermann et al., Carbohydrate Polymers, vol. 12, 1990, pp. 323-327. Article—Immobilization of (n-Bu4N)4W10O32 on Mesoporous MCM-41 and Amorphous Silicas for Photocatalytic Oxidation of Cycloalkanes with Molecular Oxygen, Andrea Maldotti et al., Journal of Catalysis, vol. 209, 2002, pp. 210-216. Article-Immobilization of (n-Bu4N)4W10O32on Mesoporous MCM-41 and Amorphous Silicas for Photocatalytic Oxidation of Cycloalkanes with Molecular Oxygen, Andrea Maldotti et al., Journal of Catalysis, vol. 209, 2002, pp. 210-216. Article-Immunization of mice with peptomers covalently couopled to aluminum oxide nanoparticles, Andreas Frey et al., Vaccine, vol. 17, 1999, pp. 3007-3019. Article—Immunization of mice with peptomers covalently couopled to aluminum oxide nanoparticles, Andreas Frey et al., Vaccine, vol. 17, 1999, pp. 3007-3019. Article-Increase in exhaled carbon dioxide during exacerbations of cystic fibrosis, Antuni, J.D. et al., (2000), Thorax, 55, 138-142. Article—Increase in exhaled carbon dioxide during exacerbations of cystic fibrosis, Antuni, J.D. et al., (2000), Thorax, 55, 138-142. Article-Increase of acetone and ammonia in urine headspace and breath during ovulation quantified using selected ion tube mass spectrometry, Diskin, A.M. et al., (2003), Physiological Measurement, 24, 191-199. Article—Increase of acetone and ammonia in urine headspace and breath during ovulation quantified using selected ion tube mass spectrometry, Diskin, A.M. et al., (2003), Physiological Measurement, 24, 191-199. Article-Increased carbon monoxide in exhaled air of asthmatic patients, Zayasu, K. et al., (1997), Journal of Respiratory Critical Care Medicine, 156, 1140-1143. Article—Increased carbon monoxide in exhaled air of asthmatic patients, Zayasu, K. et al., (1997), Journal of Respiratory Critical Care Medicine, 156, 1140-1143. Article-Increased carbon monoxide in exhaled air of subjects with upper respiratory tract infections Yamaya, M. et al., (1998), Journal of Respiratory Critical Care Medicine, 158, 311-314. Article—Increased carbon monoxide in exhaled air of subjects with upper respiratory tract infections Yamaya, M. et al., (1998), Journal of Respiratory Critical Care Medicine, 158, 311-314. Article-Increased levels of exhaled carbon monoxide in bronchiectasis, a new marker of oxidative stress, Horvath, I., et al, (1998), Thorax, 53, 867-870. Article—Increased levels of exhaled carbon monoxide in bronchiectasis, a new marker of oxidative stress, Horvath, I., et al, (1998), Thorax, 53, 867-870. Article-Ion-trap detection of volatile organic compounds in alveolar breath, Philips, M. et al., (1992), Clinical Chemistry, 38, 60-65. Article—Ion-trap detection of volatile organic compounds in alveolar breath, Philips, M. et al., (1992), Clinical Chemistry, 38, 60-65. Article-Mesoporous Sieves with Unified Hybrid Inorganic/Organic Frameworks, Brian J. Melde et al., Chem. Mater., vol. 11, No. 11, 1999, pp. 3302-3308. Article—Mesoporous Sieves with Unified Hybrid Inorganic/Organic Frameworks, Brian J. Melde et al., Chem. Mater., vol. 11, No. 11, 1999, pp. 3302-3308. Article-Nanoparticles based on polyelectrolyte complexes: effect of structure and net charge on the sorption capability for solved organic molecules, H.-M. Buchhammer et al., Colloid Polym. Sci., vol. 278, 2000, pp. 841-847. Article—Nanoparticles based on polyelectrolyte complexes: effect of structure and net charge on the sorption capability for solved organic molecules, H.-M. Buchhammer et al., Colloid Polym. Sci., vol. 278, 2000, pp. 841-847. Article-On-Line Detection of Volatile Compounds in Human Breath, Bischoff, et al., (2000), 4thEuropean Congress of Oto-Rhino Laryngology, head and neck surgery, pp. 1369-1375. Article—On-Line Detection of Volatile Compounds in Human Breath, Bischoff, et al., (2000), 4thEuropean Congress of Oto-Rhino Laryngology, head and neck surgery, pp. 1369-1375. Article-Optical fibre sensor for hydrogen sulphide monitoring in mouth air, Julio Rodríguez-Fernández et al., Analytica Chimica Acta, vol. 471, 2002, pp. 13-23. Article—Optical fibre sensor for hydrogen sulphide monitoring in mouth air, Julio Rodríguez-Fernández et al., Analytica Chimica Acta, vol. 471, 2002, pp. 13-23. Article-Oral malodour: an indicator of health status and oral cleanliness, Tonzetich, J., (1978B), International Dental Journal, 28, 309-19. Article—Oral malodour: an indicator of health status and oral cleanliness, Tonzetich, J., (1978B), International Dental Journal, 28, 309-19. Article-Ovulation prediction from cyclic changes in salivary electrical conductivity, Loweit, K. et al., (1990), American Journal of Obstetrics and Gynecology, 163(2), 708-710. Article—Ovulation prediction from cyclic changes in salivary electrical conductivity, Loweit, K. et al., (1990), American Journal of Obstetrics and Gynecology, 163(2), 708-710. Article-Pitfalls in the use of breath pentane measurements to assess lipid peroxidation, Springfield, J.R. et al., (1994), Journal of Lipid Research, 35, 1497-1504. Article—Pitfalls in the use of breath pentane measurements to assess lipid peroxidation, Springfield, J.R. et al., (1994), Journal of Lipid Research, 35, 1497-1504. Article-Purification and Characterization of Urease from Helicobacter pylori, Bruce E. Dunn et al., The Journal of Biological Chemistry, vol. 265, No. 16, Jun. 5, 1990, pp. 9464-1990. Article—Purification and Characterization of Urease from Helicobacter pylori, Bruce E. Dunn et al., The Journal of Biological Chemistry, vol. 265, No. 16, Jun. 5, 1990, pp. 9464-1990. Article-Relationship between stressful situations, salivary flow rate and oral volatile sulfur-containing compounds; Queiroz, C.S. et al., (2002), European Journal of Oral Sciences, 110, 337-340. Article—Relationship between stressful situations, salivary flow rate and oral volatile sulfur-containing compounds; Queiroz, C.S. et al., (2002), European Journal of Oral Sciences, 110, 337-340. Article-Sanguinaria extract, a new agent for the control of volatile sulfur compounds in the oral cavity, Boulware, et al., Journal of the Society of Cosmetic Chemists, 1985, vol. 36, No. 4, pp. 297-302. 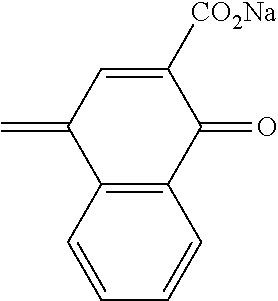 Article—Sanguinaria extract, a new agent for the control of volatile sulfur compounds in the oral cavity, Boulware, et al., Journal of the Society of Cosmetic Chemists, 1985, vol. 36, No. 4, pp. 297-302. Article-Shaping exhale durations for breath CO detection for men with mild mental retardation, Rea, J. et al., (2002), Journal of Applied Behavior Analysis, 35, 415-418. Article—Shaping exhale durations for breath CO detection for men with mild mental retardation, Rea, J. et al., (2002), Journal of Applied Behavior Analysis, 35, 415-418. Article-Significance of Ammonia in the Genesis of Gastric Epithelial Lesions Induced by Helicobacter pylori: An in vitro Study with Different Bacterial Strains and Urea Concentrations, P. Sommi et al., Digestion, vol. 57, 1996, pp. 299-304. Article—Significance of Ammonia in the Genesis of Gastric Epithelial Lesions Induced by Helicobacter pylori: An in vitro Study with Different Bacterial Strains and Urea Concentrations, P. Sommi et al., Digestion, vol. 57, 1996, pp. 299-304. Article-Significance of ammonia produced by Helicobacter pylori, Shigeji Ito et al., European Journal of Gastroenterology & Hepatology, vol. 6, No. 2, 1994, pp. 167-174. Article—Significance of ammonia produced by Helicobacter pylori, Shigeji Ito et al., European Journal of Gastroenterology & Hepatology, vol. 6, No. 2, 1994, pp. 167-174. Article-Sniffing Sinusitis, Felton, M.J., (2004), Today's Chemist At Work, Jun. 2004 (http://www.tcawonline.org). Article—Sniffing Sinusitis, Felton, M.J., (2004), Today's Chemist At Work, Jun. 2004 (http://www.tcawonline.org). Article-Standard Practice for Obtaining Spectrometric Data for Object-Color Evaluation, Published by ASTM International, Designation: E 1164-02. Article—Standard Practice for Obtaining Spectrometric Data for Object-Color Evaluation, Published by ASTM International, Designation: E 1164-02. Article-Structure and properties of silica nanoclusters at high temperatures, I. V. Schweigert et al., The American Physical Society, Physical Review B, vol. 65. No. 235410, pp. 1-9. Article—Structure and properties of silica nanoclusters at high temperatures, I. V. Schweigert et al., The American Physical Society, Physical Review B, vol. 65. No. 235410, pp. 1-9. Article-Study of the urea thermal decomposition (pyrolysis) reaction and importance to cyanuric acid production, Peter M. Schaber et al., American Laboratory, Aug. 1999, pp. 13-21. Article—Study of the urea thermal decomposition (pyrolysis) reaction and importance to cyanuric acid production, Peter M. Schaber et al., American Laboratory, Aug. 1999, pp. 13-21. Article-The Colloid Chemistry of Silica, American Chemical Society 200thNational Meeting, Aug. 26-31, 1990, pp. 22-23 and pp. 52-59. Article—The Colloid Chemistry of Silica, American Chemical Society 200thNational Meeting, Aug. 26-31, 1990, pp. 22-23 and pp. 52-59. Article-Validation of13C-Urea Breath Test for the Diagnosis of Helicobacter Pylori Infection in the Singapore Population, T. S. Chua et al., Singapore Medical Journal, vol. 43, No. 8, 2002, pp. 408-411. Article—Validation of13C-Urea Breath Test for the Diagnosis of Helicobacter Pylori Infection in the Singapore Population, T. S. Chua et al., Singapore Medical Journal, vol. 43, No. 8, 2002, pp. 408-411. Paper—Uniform Deposition of Ultrathin Polymer Films on the Surfaces of Al2O3 Nanoparticles by a Plasma Treatment, Donglu Shi et al., University of Cincinnati and University of Michigan, Jun. 2000, pp. 1-15. Paper-Uniform Deposition of Ultrathin Polymer Films on the Surfaces of Al2O3Nanoparticles by a Plasma Treatment, Donglu Shi et al., University of Cincinnati and University of Michigan, Jun. 2000, pp. 1-15. Product Information Sheet for Snowtex®, 6 pages. Search Report and Written Opinion for PCT/US2004/027626 dated Jul. 13, 2005, 17 pages.